High concentrations of minerals in the body can have ill effects on your health. Symptoms of mineral toxicity vary as toxic levels depend on the type of mineral and how much of it your body takes in. Mineral toxicity can occur as the result of accidentally consuming too much of a particular mineral or taking too many mineral supplements or drugs that contain minerals. Overexposure to certain industrial pollutants or chemicals, and in some cases disease, can also cause mineral toxicity. When taken into the body in high doses, minerals can produce toxic effects. High levels of iodine in the bloodstream can interfere with hormone functioning. Too much sodium can cause confusion, seizures, coma and even death. Selenium is a mineral that is toxic in just small doses. Symptoms include black fingernails and the smell of garlic on your breath and skin. Boron can be toxic in quantities of more than 100 mg causing symptoms such as vomiting, diarrhea, rash, shock and coma. Phosphorus toxicity prevents the absorption of calcium and magnesium in the body. When ingested in amounts more than 1 g daily, phosphorus can cause diarrhea or lead to calcification of organs and soft tissues. Some types of mineral toxicity are more rare than others. Although magnesium toxicity isn’t usually a concern for most healthy individuals, it can be a problem for people who have kidney disease. When the kidneys fail to regulate the amount of magnesium in the body, a person may experience symptoms such as nausea and general malaise. Copper toxicity is also rare, however, excessive intake can cause vomiting, diarrhea, irritability and dementia. Zinc is generally considered to be non-toxic although extremely high doses of it can lead to symptoms such as nausea, vomiting and diarrhea. Manganese is a mineral that is easily excreted from the body; therefore, toxicity is rare. When it does occur, overexposure can cause lethargy, tremors and other neurological disorders or psychiatric symptoms. Iron toxicity isn’t as uncommon as it once was. Children who accidentally ingest iron tablets can suffer seizures, liver damage, shock, coma and death. Taking a clinical history and then measuring the levels of different minerals in blood plasma and urine are the methods for diagnosing mineral toxicity. Doctors look to see if lab tests measure concentrations of a mineral above the normal range. Physicians also look for clinical symptoms of diseases that cause mineral toxicity. Male infants with Menkes disease – a disorder in which the body does not absorb enough copper – typically have poor muscle tone, weakened bones and fail to thrive. Children with Wilson’s disease – another disorder that involves copper metabolism – may present with symptoms such as tremor, drooling, loss of coordination, easy bruising or jaundice. Hemochromatosis – a condition in which too much iron accumulates in the body – leads to iron toxicity. Symptoms of hemochromatosis often include joint pain and lack of energy and can lead to thyroid and heart problems. Limiting the use of dietary supplements can prevent mineral toxicity. 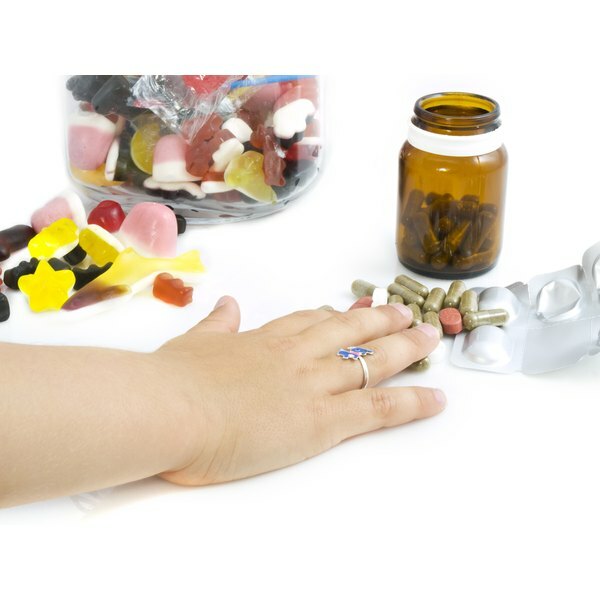 Parents should also keep mineral supplements and iron tablets out of the reach of young children. Try to get the nutrients your body needs from natural food sources rather than dietary supplements. Generally, you won’t need dietary supplements if you eat a well-balanced healthy diet. Postmenopausal women, individuals who consume fewer than 1,600 calories a day and people who are suffering from a vitamin or mineral deficiency may need to take dietary supplements. Your doctor may also prescribe supplements if you have a medical condition that interferes with digestion or your body’s ability to absorb nutrients, according MayoClinic.com. Take dietary supplements only under the supervision of your health care provider or a licensed nutritionist. Healthy-Vitamin-Choice.com; Mineral Toxicity; Peter Tylee, et al.